When it comes to batteries one gets a little jaded by all the press releases and stories. A check back to two years ago about the breakthroughs at that time shows little has come to the market. Yet the research field is packed with innovation trying to build up more capacity and recharge cycles. The issue seems to be the chemistry for the opposing anodes and cathodes can be very problematic. A great idea for one usually turns out to be incompatible with the other – leaving the great discovery in the lurch. So when MIT’s Yang Shao-Horn comes up with a combined anode and cathode pair with the carbon nanotubes on the positive side, a writer is likely to pay a little closer attention. Lets get the problem out first for a change in pace. Its not a killer, but deserves noting – the MIT team achieved its best results with very thin electrodes. The performance dropped off considerably as the electrodes were made thicker. Because thicker electrodes can store more charges, they allow a battery to hold more energy. So for now, the new MIT batteries will be best suited to applications with low overall power demands. Shao-Horn says she is working on finding a way to make thicker electrodes that can still move charges quickly. The probability she’ll get it done is quite high. The team is reporting in Nature an alternative construction approach based on the redox reactions of functional groups on the surfaces of the carbon nanotubes. Layer-by-layer techniques are used to assemble an electrode that consists of additive-free, densely packed and functionalized multiwalled carbon nanotubes. The electrode, which is several micrometres thick, can store lithium up to a reversible gravimetric capacity of ~200 mAh/g−1 while also delivering 100 kW/kg−1 of power and providing lifetimes in excess of thousands of cycles, both of which are comparable to electrochemical capacitor electrodes. A device using the nanotube electrode as the positive electrode and lithium titanium oxide as a negative electrode has a gravimetric energy about 5 times higher than conventional electrochemical capacitors and power delivery about 10 times higher than conventional lithium-ion batteries. The good professor is getting somewhere significant with these numbers. 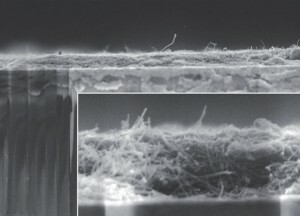 Carbon Nanotubes Doped for LithiumIon Batteries from MIT. Click image for more info. To produce the powerful new electrode material, the team uses in lay terms, a layer-by-layer fabrication method, in which a base material is alternately dipped in solutions containing carbon nanotubes that have been treated with simple organic compounds that give them either a positive or negative net charge. When these layers are alternated on a surface, they bond tightly together because of the complementary and attracting positive and negative charges, making a stable and durable film. In the new battery electrode, carbon nanotubes — a form of pure carbon in which sheets of carbon atoms are rolled up into tiny tubes — “self-assemble” into a tightly bound structure that is porous at the nanometer scale (billionths of a meter). The carbon nanotubes as built up have many oxygen groups on their surfaces, which can store a large number of lithium ions; this enables carbon nanotubes for the first time to serve as the positive electrode in lithium batteries, instead of just the negative electrode. When these batteries are in use, positively charged lithium ions travel through the electrolyte to the cathode, producing an electric current; when they are recharged, an external current causes these ions to move the opposite way, so they become embedded in the spaces in the porous material of the anode. That’s where all those oxygen groups pay off – the more the higher the capacity. The more stable the more life cycles. Chemical engineering student Seung Woo Lee who’s earning a PhD in 2010 expounds with the new material in a lithium battery demonstrates some of the advantages of both capacitors, which can produce very high power outputs in short bursts, and lithium batteries, which can provide lower power steadily for long periods. For consumers making choices fast discharge is good but longevity is crucial. The MIT team is claiming after 1,000 cycles of charging and discharging a test battery, there was no detectable change in the material’s performance. The test then becomes the economics of a battery from a production and sales price view. To answer that Professor Hammond explains while the electrode material was produced by alternately dipping a substrate into two different solutions – a relatively time-consuming process – she suggests that the process could be modified to a spraying of the alternate layers onto a moving ribbon of material, a technique now being developed in her lab. That could eventually open the possibility of a continuous manufacturing process that could be scaled up to high volumes for commercial production, and could also be used to produce thicker electrodes with a greater power capacity. “There isn’t a real limit” on the potential thickness, Hammond says. “The only limit is the time it takes to make the layers,” and the spraying technique can be up to 100 times faster than dipping, she says. The MIT team just may have something we’ll be able to buy in a year or two. The press release mentions they’re working on larger materials suitable for automobile applications. Carbon nanotubes are getting looked at as production items rather than just lab production. If the technology charges as well as is discharges – the MIT team has a real battery breakthrough when the economics get working. This is just enough to concern the ultracapacitor folks, too. Keep charge for a diesel engine without an alturinator?